If there’s one thing I hate using nowadays, it’s the ancient remote control. You’d think it would be obsolete by now, but it still lives on and won’t go away anytime soon. Thankfully, if you have a device that is fairly new (a couple of years old), then you can use your smartphone to control it. I’m talking about controlling HDTVs, streaming set-top boxes, cable boxes, game consoles and the likes. I’m simply too lazy and cheap to configure and purchase a universal remote. It works for some people, but I’ve never been able to get any universal remote to control everything, meaning I still need several remotes. I also tried purchasing an adapter that plugs into my phone, which can control multiple IR devices, but all of them were flaky and couldn’t control all my devices. Finally, I just decided that I’m going to download an app for every device I have and control things that way. Surprisingly, this has worked out well. In this article, I’m going to talk about the different apps you can use to control all of your different devices. Some apps are definitely better than others, but all pretty much have the same basic remote functionality. If you have a cable TV box, you probably don’t use your HDTV remote other than to switch the input. If you have a smart technician come out to your house when getting cable installed, they might even be able to configure that on the cable TV remote. Luckily, most major TV manufacturers have remote control apps for their HDTVs, which makes it easy to control the volume, change the channel and switch inputs. One major exception is Vizio. They have a SmartCast app, but it only works with a SmartCast HDTV, which they are starting to sell in 2016. It’s ridiculous they don’t have an app for controlling all of their other TVs. Still, there are many third-party developers who have written apps to control TVs that don’t have official apps from the OEMs. I’m going to list out the different apps for some of the major brands. If you have a different TV, just search the app store for the manufacturer of your TV. Apps for your TV are great, but you probably spend most of your time using a remote for a streaming set-top box or for a cable box. Luckily, official apps for these devices are vastly better than the TV apps we just mentioned. Let’s start off with set-top boxes like the Apple TV, Roku, Amazon Fire TV, Nvidia Shield Android TV and Chromecast. These five are pretty much the best set-top boxes currently on the market. If you own the Apple TV, you’ll have to control it using an iPhone or iPad because Apple doesn’t have a remote app for Android. 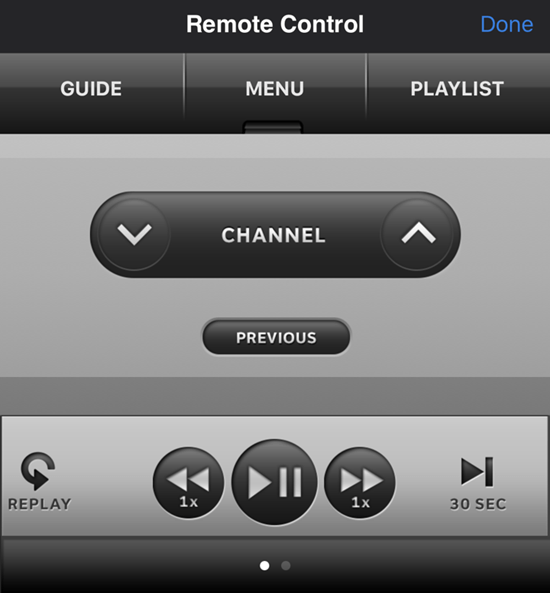 The Remote by Apple app will let you navigate around menus and input text on your Apple TV. If you have the 4th generation Apple TV running tvOS, it won’t let you control the volume or use Siri. It also can’t act like a game controller like the actual Siri remote. If you have a Roku, you’ve got more options when it comes to controlling your Roku player. The app is available on pretty much all platforms. What I like about the Roku app is that you can use your voice to search for content. It also has a Play on Roku feature that lets you view your photos and videos from your smartphone on your TV. The Fire TV app is a basic app that has been done very well. It’s rated fairly high in both the Google Play and iTunes App stores. You can use your voice to search using this app also. Other than that, it lets you control your Fire TV using your smartphone. The Nvidia Shield is a pretty cool device because it’s way more powerful than all the other set-top boxes and it comes with a full-fledged controller for gaming. Anyway, you can also purchase a remote for it separately if you like. Luckily, the Android TV Remote Control app will allow you to control some basic functions on the Nvidia Shield Android TV. There is no iOS version of this app. The Chromecast doesn’t even come with a controller of any kind. It literally can only be controlled using your smartphone! Nonetheless, they do have a Google Cast app, but it really doesn’t do all that much. With a Chromecast, you basically open apps that are Chromecast-enabled, which means you just tap an icon and it’ll stream the content from that app to your Chromecast. If you are a cable TV subscriber, then you are also in luck. Pretty much every cable network has their own app, which allows you to not only watch content on your phone, but also control your cable TV box from your phone. The features vary wildly depending on which TV provider you have. For example, I have DIRECTV and the app is excellent. You can quickly see your recordings and tap them to play on your TV. You can also browse the guide and tap on a show or channel to start watching it on the TV. Here are the links to the most popular TV provider apps. All of the apps have a lot of other features beyond just using the app as a remote. You can manage DVR recordings, purchase on demand movies, etc. Lastly, you can download dedicated apps for the PlayStation and Xbox consoles to not only control them, but view your messages, stats, game progress, etc. The PlayStation app is vastly inferior to the Xbox SmartGlass app, which just works so much better, looks so much better and is just generally better. You can literally use the PlayStation app to navigate around menus on your console and that’s about it. You can do a lot more stuff with the Xbox app. So if you are sick of using so many different remotes to control your gadgets, check out all the above-mentioned apps, which makes things a little bit easier, especially for your friend or family member who can’t even figure out which remote turns on the TV! Enjoy!